ONE OWNER! CLEAN CAR FAX! VOLVO QUALITY! BRAND NEW TIMING BELT AND WATER PUMP INSTALLED WHICH BRINGS ADDED VALUE! SPORTY! LEATHER! SUNROOF! Includes:5-Cyl, Turbo, 2.5 Liter, Automatic, 6-Spd Geartronic w/Overdrive, FWD, Traction Control, Dynamic Stability Control, ABS (4-Wheel), Anti-Theft System, Keyless Entry, Air Conditioning, Power Windows, Power Door Locks, Cruise Control, Power Steering, Tilt & Telescoping Wheel, AM/FM Stereo, Sirius Satellite, Bluetooth Wireless, Dual Air Bags, Side Air Bags, F&R Head Curtain Air Bags, Daytime Running Lights. The mid-size Volvo S60 was completely redesigned for 2011, recast as a more flamboyantly styled luxury sport sedan. The S60 debuted the automaker's City Safety feature and some truly innovative accident avoidance equipment. The new-for-2012 250-hp 5-cylinder turbocharged model offers lighter weight and front-wheel drive for improved fuel economy, with similar performance capabilities. Volvo made huge leap with its 2011 S60 sedan--in performance, styling and safety. With its new 250-hp turbocharged 5-cylinder engine and front wheel drive, the S60 T5 model will be lighter and even more fuel-efficient than some other models in its class, while its styling remains trend-setting inside and out. The T5 will continue at the front of the pack with its new City Safety system--one that not only serves to warn the driver of an impending crash, but applies the brakes to help avoid it completely. With that, as well as a host of other accident-avoidance features, the S60 series remains the car for those concerned about safety, style and performance. The new T5 engine is a 2.5-liter inline five-cylinder, iron block with aluminum cylinder liners, intercooled turbocharger, making an impressive 250 horsepower with 266 foot-pounds of torque, plus a feature that gives 295 foot-pounds of torque for 10 seconds. Zero to 60 mph can be accomplished in 6.8 seconds. Volvo estimates the T5 will get 20 city, 30 highway miles per gallon, and costs the 2012 S60 T5 costs thousands less than the prior model similarly equipped. The T5 uses a new 6-speed automatic. We think the T5 offers good value, considering its power, safety engineering, comfort and style. 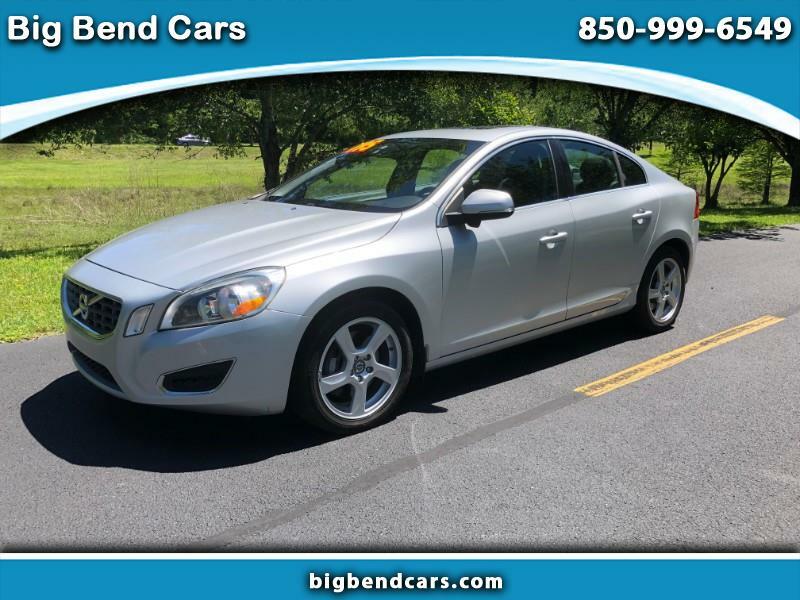 The 2012 Volvo S60 T5 ($31,150) uses a new 2.5-liter turbocharged five-cylinder engine making 250 hp, 6-speed automatic, and front-wheel drive. Standard equipment (includes all power, sport seats front and rear, leather-wrapped steering wheel, power driver seat, 7-inch color display, dual zone climate control, 160-watt 8-speaker CD/DVD/MP3 sound system, and Bluetooth. The T5 Premium Package ($1900) upgrades with leather upholstery, moonroof, power passenger seat and other features. Safety equipment that comes standard on all models includes Dynamic Stability and Traction Control, Side Impact Protection System (SIPS), Whiplash Protection Seating System (WHIPS), dual stage front airbags, side curtain airbags, side impact airbags, tire pressure monitoring system, and anti-lock braking system with hydraulic brake assist, optimized hydraulic brakes, ready alert brakes and fading brake support. The T5 is a great value with a ton of performance.